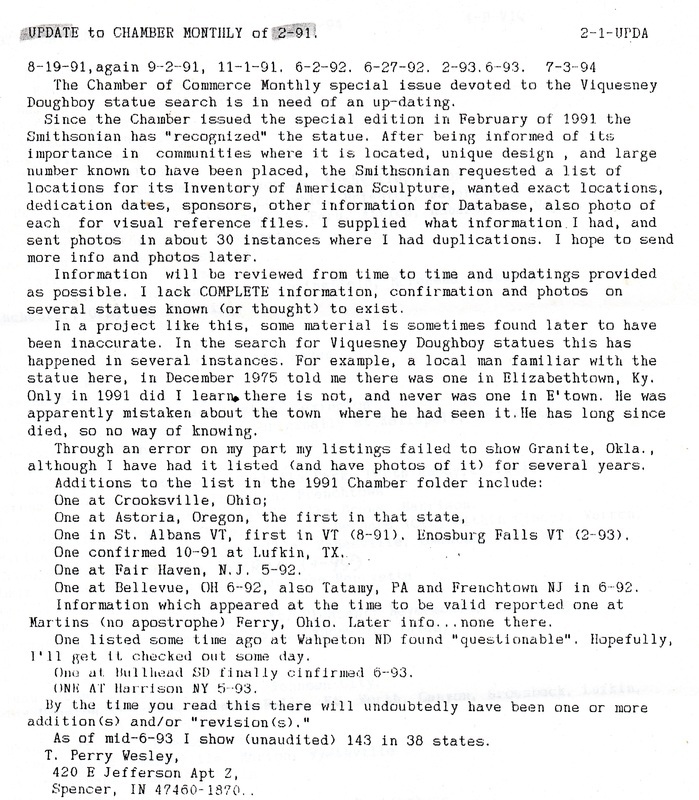 Original Viquesney Doughboy researcher T. Perry Wesley tried to keep his information current; as you can see in the first line of the document below, his 1991 Doughboy Report went through at least 7 more revisions up to July of 1994. Unfortunately, not many people have seen this revised list; in it he correctly removed the entry for Elizabethtown, Kentucky and Martins Ferry, Ohio, as well as flagging Wahpeton, North Dakota as "questionable" (further research would have proved his suspicions correct; the Doughboy at Wahpeton is a copy of John Paulding's "Over the Top to Victory"). But he also made some more mistakes; Bellevue, Ohio has no such statue, and never did (I checked with the city and their library), and for some inexplicable reason, Mr. Wesley reversed himself on Astoria, Oregon, which he correctly identified on his 1991 list as not being a Viquesney, but then here says it is (it's not). But he did correctly add back Tatamy, Pennsylvania, which he mistakenly had listed as not a Viquesney on his 1991 list. Lastly, Mr. Wesley seemed never to have found a partial list of locations that Viquesney himself published in 1935 in his "World War Memorial Association" brochure that would have added at least 18 more valid locations to the 1991 list. Incredibly, Mr. Wesley was aware of the booklet, which he mentioned by name in his 1991 report, but apparently missed Viquesney's list inside it. By 1995, Mr. Wesley had found a few more locations that were already on Viquesney's list; it would have saved him a lot of work if he had found it earlier.